Do surfers feel squeezed when we summer sun gawkers skim their swells? Are artists alienated by onlooker amateurs? Can climbers feel crunched by this casual crest crawler? Sadly, and admittedly, guilty as charged in all cases, particularly with our most recent infraction having occurred while exploring the breathtaking landscapes of Moab, Utah www.discovermoab.com with its alluring red rock and vaulted skies. You see, not far from our suburbia fish bowl lies beauty almost beyond description and yet, like a painter whose house remains unpainted, we fit the bill of hundreds of thousands of others who all-too-often scrimp and save only to spend our savings on someone else’s shores. Not entirely so this season as we selected the “local” wonder that is Moab for a couples get away. 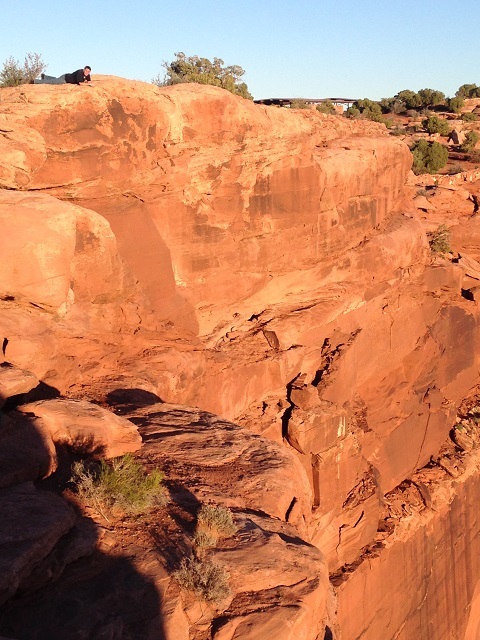 While it may still remain obscure among the general population, Moab has long since lost its anonymity among nature hounds. 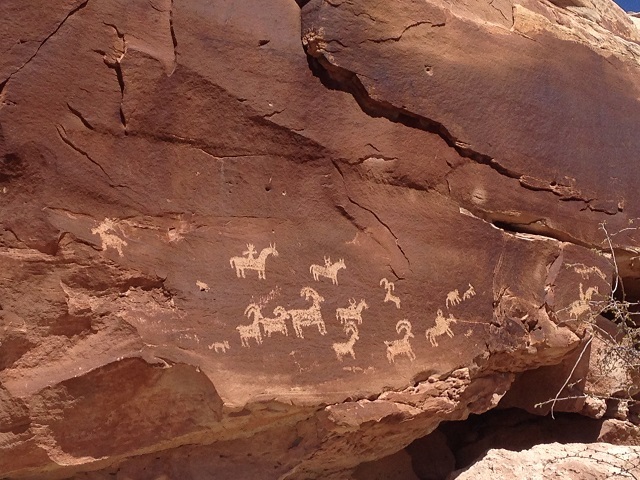 This Southern Utah gem has hosted its share of jeep safaris, river raft floats, mountain bike events, film and art festivals, marathon and endurance races, and even dog competitions – all in the shadows of multiple national and state parks and each within just this past year. For this couple (who could be accused of being more familiar “beating a dead horse” or with the “golden arches”) we ventured out to Dead Horse Point and Arches National Park for our weekend of free time and fun. With an early exit from a day’s work in Salt Lake City, we were just in time to catch the setting sun on one of the most photographed points of interest in all the Western United States: Dead Horse Point State Park stateparks.utah.gov/parks/dead-horse. Maybe we’re admitting our “tween generation’s” status by admitting that, along with taking in the awesome wonder, we couldn’t help but YouTube the Mission Impossible 2 movie trailer to see just the angle where Tom Cruise scaled these majestic walls at opening credits (the likes of which I’m laying atop in the picture below). 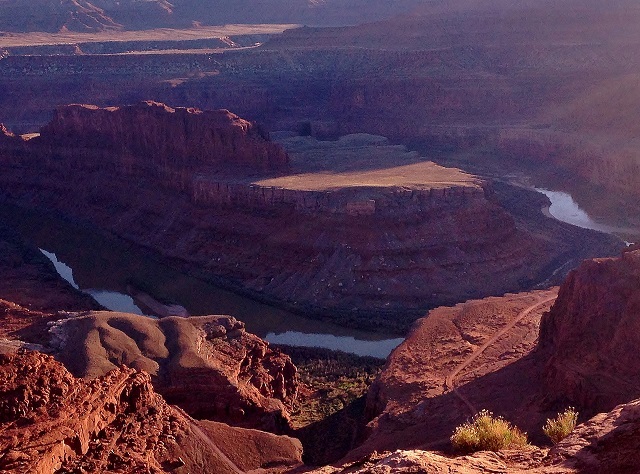 With its horseshoe shaped, river-carved base and its sheer sprawling cliffs, Dead Horse Point is a must. Arrive before 6pm to experience the visitor’s center and gift shop. We arrived just after 6 on a hazy spring evening. Sun lit peaks soon gave way to shadowed expanse and colors deepened and clarified as rapidly as the falling of that sun. The nominal fee for entrance (ranging from $2 to $10 at print time, based on your vehicle and age) seemed only a token fee for such grandeur. A sunset cuddle atop cliffs of crimson was the perfect end to a simple day. Our half hour drive back to Moab came with a late check in to the Aarchway Inn www.aarchwayinn.com. With mostly rave reviews on the big travel sites, we found Aarchway to be all we’d hoped it would be. Rooms were spacious and clean. Amenities abounded (courts, pool, etc.). Breakfast in the morning had ample options; indeed, families and twosomes coexisted without incident. Our day began early, and it’s good it did. There was a half hour wait (about 100 cars) on this Saturday morning just to exit the highway, pay, and get in. Granted, the wait was entertaining as a family had stopped at the mammoth sand hill across the freeway and 4-5 children and their dad were taking turns summiting the hill only to roll, tumble and topple to the sandy opening at bottom. We were tired (but enthralled) just watching them! Once at the gate, we were warned of the potential for lack of parking at their more popular sites (Delicate and Landscape Arches) so we planned to be flexible. Balanced Rock and Turret Arches were a 2 and 3 (maybe 4) respectively on a scale from 1 to 10 for “hard” hikes. We easily sauntered to each in the cool of the morning. Landscape Arch was not so easy. Perhaps it was a 6 on the scale (for length and terrain – especially in the heat). We hit it more in the mid afternoon and trails were often sandy and up and down. As the largest of their readily accessible free standing arches, it surely was a sight to see, yet one we might have skipped without too much frustration. Delicate Arch was the hike we’d do and do again. Make no mistake, this is an 8-9 on the “non-granola” scale for which we fall. We’d committed to each other that we’d first view the arch (famously displayed on most Utah license plates that aren’t “Ski Utah” plates) from the viewpoint below and decide from there. The stamp sized view simply wasn’t enough for our liking. We then made a pact that, if we were able to find parking close to the trail head, we’d make this hike if it killed us. When a spot opened immediately at the trailhead, we were committed! Taking plenty of water (a quart or so for each of us) we set out to conquer. The first few hundred yards of the hike are level and pleasant. We were immediately rewarded with aged petroglyphs found just off the trail. From there, freeing from the valley floor below, truly we had no idea the distance or grade in comparison to all else we had previously hiked. Now, I like to think of myself as “fat-letic”. I played sports for 35+ of my 45 years of life and coached for still another several years. While I’ve not fully maintained that status, we’d just returned from a week of walking theme parks in Orlando and we felt up to the task. That said, we were ill prepared for this hike. The grade was steep for most of the way. The sun was hot. Shade was scarce. Water was little relief. Stops were few and far between. 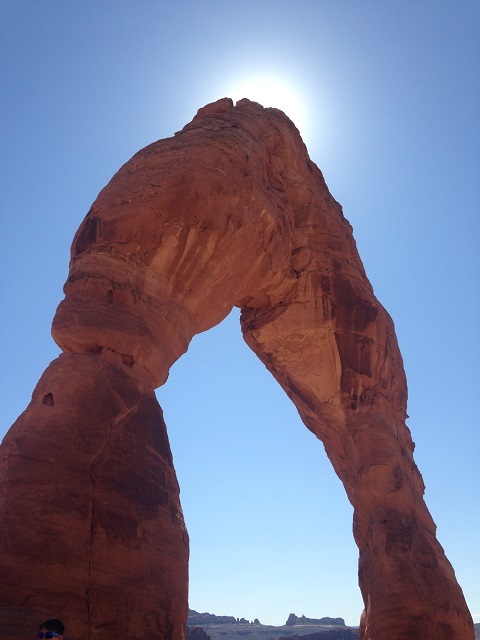 Before finishing your hike to the arch, we’d recommend that the “pinnacle” of stops where you can be shielded from the heat would be the shaded rock atop the grade of the hike (just before again picking up the path that is only 500 yards or so from Delicate Arch itself). We stopped on the slab of rock in the shade there and laid every inch of exposed flesh on that shaded rock. Within minutes our core temperatures had gone down and we were back to enjoying ourselves instead of cursing the heat. Heat aside, this was a memory and vista with payoff beyond compare. Upon topping the mountain, we immediately wanted to share it with loved ones who weren’t there. We vowed to return. After some time taking in the arch and the view from atop, we descended with reflections that were deep and reverent. Creations seemed to cry of a Creator. We felt naturally inclined to reassure those who were passing by us just beginning their ascent. We steadied and added cairns for added direction and hope. This was a hike not to soon be forgotten. The night gave way to hunger. As always, we wanted to eat local. Where better than the Moab Diner www.moabdiner.com to cap off our day? I was hooked at the teaser that’s scrawled without the diner’s walls that touts the “The Best Green Chili in Utah”. That screamed to be proven or disproved. And, right they were! 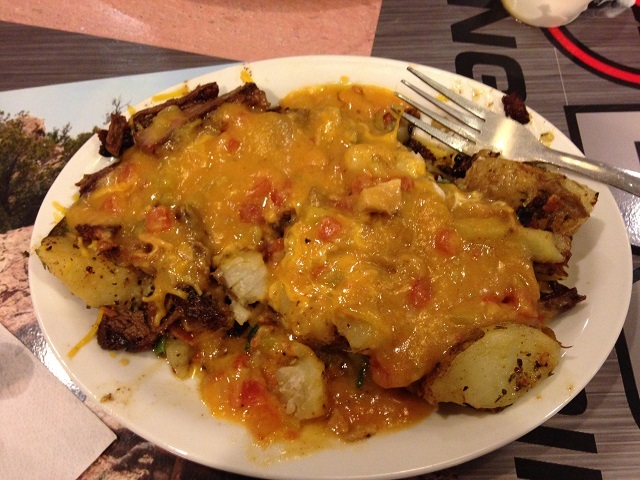 The Green Chili Smothered Sweetwater Potatoes with Skirt Steak added was out of this world! We ended the night at a local fav known as “MoYo”. Frozen yogurt at www.moabyogurt.com was both a cool and refreshing way to finish our blazing (polysemy intended) day.